I’ve also been learning a lot about the intricacies Brans-Dicke gravity and about the parameterized post-Newtonian (PPN) formalism. Brans-Dicke theory is perhaps the simplest modified gravity theory that there is, and I have to explain to someone why the gravity theory that I spend time working on doesn’t quite behave like Brans-Dicke theory. In the process, I find out things about Brans-Dicke theory that I never knew. And, I’ve also been doing a fair bit of SCPI programming this month. SCPI is a standardized way for computers to talk to measurement instrumentation, and an old program I wrote used to use a non-standard way… not anymore. Meanwhile, in all the spare time that I’ve left, I’ve been learning Brook+, a supercomputer programming language based on C… that is because my new test machine is a supercomputer, sort of, with its graphics card that doubles as a numeric vector processor capable in theory of up to a trillion single precision floating point instructions per second… and nearly as many in practice, in the test programs that I threw at it. I’m also learning a little more about the infamous cosmological constant problem (why is the cosmological constant at least over 50 orders magnitude too small but not exactly zero?) and about quantum gravity. Of all the living heads of state, our Queen (yes, she’s the queen of Canada, too) is perhaps the only one who actually served in World War 2. So why on Earth is she not invited to next month’s 65th anniversary D-day ceremonies? If it’s the French doing it, then perhaps it’s time to rename French fries to, say, Quebec fries? North Korea today tested two additional missiles. Reason to worry, to be sure. But there’s absolutely no reason for CTV Ottawa to announce this as “two more nuclear tests”. Not all rockets are nuclear. In fact, as far as I know we have no reason to believe that North Korea is anywhere near mastering the technology to place a nuclear weapon on top of a missile. So please… stop the hype and try to report the actual news, if you would? Breaking news this morning: North Korea popped another one, another nuke test, that is. The world issues stern warning, and sanctions continue. Sanctions? When will the world learn that for a closed, totalitarian society for which the number one enemy is a strong middle class, sanctions are a lifeline? Sure, they might hurt the leadership and the military/industrial complex, but they hurt their nascent middle class far more, not to mention that sanctions provide the leadership with the perfect excuse for anything that might go wrong within the country. And it’s not like in this day and age, it’s that hard for North Korea’s agents to obtain high technology for their military programs. I just bought a graphics card that can serve as a supercomputer vector processor with a raw performance exceeding a teraflop, for less than a thousand dollars. And never mind export restrictions… the card itself was manufactured in China, perhaps right next to the Korean border for all I know. Ever since I installed a Microsoft update, not sure which one, whenever I reboot my computer, XP starts up opening a folder, notably C:\Program Files\Microsoft\. Since I don’t reboot my computer that often, it’s only a minor annoyance, but I’ve learned long ago that minor annoyances can be symptoms of bigger problems, so I wanted to get to the bottom of it. I heard on CBC Newsnet that according the US hurricane center, there is a 50% likelihood that this year will be an average year, hurricane-wise. I am still pondering whether or not this statement had any information content. And you wonder that people distrust lawyers. The text seemed a bit long. I decided to copy it and paste it into another application, for better viewing. To their credit, they allowed me to copy. But, absent a Select All command, it was a tad hard to copy everything. Nonetheless, I managed. I was confronted by a huge bulk of text with no line breaks at all in Windows Notepad. I inserted some line breaks. The result is a 6-page legal agreement that, for all I know, obliges me to sell of all my future children and descendants to Adobe. Warranty Disclaimer and Software License Agreement. THIS DOCUMENT INCLUDES WARRANTY INFORMATION (PART I) AND A LICENSE AGREEMENT GOVERNING THE USE OF ADOBE SOFTWARE (PART II). THE SOFTWARE AND OTHER INFORMATION IS DELIVERED TO YOU “AS IS” AND WITH ALL FAULTS. ADOBE AND ITS SUPPLIERS AND CERTIFICATE AUTHORITIES DO NOT AND CANNOT WARRANT THE PERFORMANCE OR RESULTS YOU MAY OBTAIN BY USING THE SOFTWARE, CERTIFICATE AUTHORITY SERVICES OR OTHER THIRD PARTY OFFERINGS. EXCEPT TO THE EXTENT ANY WARRANTY, CONDITION, REPRESENTATION OR TERM CANNOT OR MAY NOT BE EXCLUDED OR LIMITED BY LAW APPLICABLE TO YOU IN YOUR JURISDICTION, ADOBE AND ITS SUPPLIERS AND CERTIFICATE AUTHORITIES MAKE NO WARRANTIES CONDITIONS, REPRESENTATIONS, OR TERMS (EXPRESS OR IMPLIED WHETHER BY STATUTE, COMMON LAW, CUSTOM, USAGE OR OTHERWISE) AS TO ANY MATTER INCLUDING WITHOUT LIMITATION NONINFRINGEMENT OF THIRD PARTY RIGHTS, MERCHANTABILITY, INTEGRATION, SATISFACTORY QUALITY, OR FITNESS FOR ANY PARTICULAR PURPOSE. BY USING, COPYING OR DISTRIBUTING ALL OR ANY PORTION OF THE ADOBE SOFTWARE, YOU ACCEPT ALL THE TERMS AND CONDITIONS OF THIS AGREEMENT, INCLUDING, IN PARTICULAR, THE PROVISIONS ON: USE CONTAINED IN SECTION 2; TRANSFERABILITY IN SECTION 4; CONNECTIVITY AND PRIVACY IN SECTION 6; WARRANTY IN SECTION 9 AND LIABILITY IN SECTIONS 10 AND 16. UPON ACCEPTANCE, THIS AGREEMENT IS ENFORCEABLE AGAINST YOU AND ANY ENTITY THAT OBTAINED THE SOFTWARE AND ON WHOSE BEHALF IT IS USED. IF YOU DO NOT AGREE, DO NOT USE THE SOFTWARE. ADOBE PERMITS YOU TO USE THE SOFTWARE ONLY IN ACCORDANCE WITH THE TERMS OF THIS AGREEMENT. USE OF SOME THIRD PARTY MATERIALS INCLUDED IN THE SOFTWARE MAY BE SUBJECT TO OTHER TERMS AND CONDITIONS TYPICALLY FOUND IN A SEPARATE LICENSE AGREEMENT, A “READ ME” FILE LOCATED NEAR SUCH MATERIALS OR IN THE “THIRD PARTY SOFTWARE NOTICES AND/OR ADDITIONAL TERMS AND CONDITIONS” FOUND AT http://www.adobe.com/go/thirdparty . “Adobe” means Adobe Systems Incorporated, a Delaware corporation, 345 Park Avenue, San Jose, California 95110, if subsection 12(a) of this agreement applies; otherwise it means Adobe Systems Software Ireland Limited, Unit 3100, Lake Drive, City West Campus, Saggart D24, Republic of Ireland, a company organized under the laws of Ireland and an affiliate and licensee of Adobe Systems Incorporated. “Computer” means a virtual or physical personal electronic device that accepts information in digital or similar form and manipulates it for a specific result based on a sequence of instructions. “Software” means (a) all of the contents of the files (delivered electronically or on physical media), or disk(s) or other media with which this agreement is provided, which may include (i) Adobe or third party computer information or software, including Adobe Reader® (“Adobe Reader”), Adobe® AIR™ (“Adobe AIR”), Adobe Flash® Player, Shockwave® Player and Authorware® Player (collectively, Adobe AIR and the Flash, Shockwave and Authorware players are the “Adobe Runtimes”); (ii) related explanatory written materials or files (“Documentation”); and (iii) fonts; and (b) upgrades, modified versions, updates, additions, and copies of the foregoing, provided to you by Adobe at any time (collectively, “Updates”). “Use” means to access, install, download, copy, or otherwise benefit from using the functionality of the Software. 2.2 Server Use. This agreement does not permit you to install or use the software on a computer file server. For information on use of software on a computer file server please refer to http://www.adobe.com/go/acrobat_distribute for information about Adobe Reader; or http://www.adobe.com/go/licensing for information about the Adobe Runtimes. 2.3 Distribution. This license does not grant you the right to sublicense or distribute the Software. For information about obtaining the right to distribute the Software on tangible media or through an internal network or with your product or service please refer to http://www.adobe.com/go/acrobat_distribute for information about Adobe Reader; or http://www.adobe.com/go/licensing for information about the Adobe Runtimes. 3.1 Adobe Runtime Restrictions. You will not use any Adobe Runtime on any non-PC device or with any embedded or device version of any operating system. For the avoidance of doubt, and by example only, you may not use an Adobe Runtime on any (a) mobile device, set top box (STB), handheld, phone, web pad, tablet and Tablet PC (other than with Windows XP Tablet PC Edition and its successors), game console, TV, DVD player, media center (other than with Windows XP Media Center Edition and its successors), electronic billboard or other digital signage, Internet appliance or other Internet-connected device, PDA, medical device, ATM, telematic device, gaming machine, home automation system, kiosk, remote control device, or any other consumer electronics device, (b) operator-based mobile, cable, satellite, or television system or (c) other closed system device. For information on licensing Adobe Runtimes for use on such systems please visit http://www.adobe.com/go/licensing . 3.2 Adobe Reader Restrictions. Adobe Reader is licensed and distributed by Adobe for viewing, distributing and sharing PDF files. 3.2.1 Conversion Restrictions. You will not integrate or use Adobe Reader with any other software, plug-in or enhancement that uses or relies upon Adobe Reader when converting or transforming PDF files into a different format (e.g., a PDF file into a TIFF, JPEG, or SVG file). 3.2.2 Plug-in Restrictions. You will not integrate or use Adobe Reader with any plug-in software not developed in accordance with the Adobe Integration Key License Agreement. 3.2.3 Disabled Features. Adobe Reader may contain features or functionalities that are hidden or appear disabled or “grayed out” (the “Disabled Features”). Disabled Features will activate only when opening a PDF document that was created using enabling technology available only from Adobe. You will not access, or attempt to access, any Disabled Features other than through the use of such enabling technologies, nor will you rely on Adobe Reader to create a feature substantially similar to any Disabled Feature or otherwise circumvent the technology that controls activation of any such feature. For more information on disabled features, please refer to http://www.adobe.com/go/readerextensions . 3.3 Notices. Any copy of the Software that you make must contain the same copyright and other proprietary notices that appear on or in the Software. 3.4 No Modification or Reverse Engineering. You may not modify, adapt, translate or create derivative works based upon the Software. You will not reverse engineer, decompile, disassemble or otherwise attempt to discover the source code of the Software except to the extent you may be expressly permitted to reverse engineer or decompile under applicable law. (c) the receiving party accepts the terms and conditions of this agreement and any other terms and conditions upon which you obtained a valid license to the Software. Notwithstanding the foregoing, you may not transfer education, pre-release, or not for resale copies of the Software. The Software and any authorized copies that you make are the intellectual property of Adobe Systems Incorporated and its suppliers. The structure, organization and code of the Software are the valuable trade secrets and confidential information of Adobe Systems Incorporated and its suppliers. The Software is protected by law, including without limitation the copyright laws of the United States and other countries, and by international treaty provisions. Except as expressly stated herein, this agreement does not grant you any intellectual property rights in the Software and all rights not expressly granted are reserved by Adobe and its suppliers. 6.3 Settings Manager. Flash Player may cause certain user settings to be stored on your Computer as a local shared object. These settings are not associated with you, but allow you to configure certain settings within the Flash Player. You can find more information on local shared objects at http://www.adobe.com/go/flashplayer_security and more information on the Settings Manager at http://www.adobe.com/go/settingsmanager . The Software may allow you to access and interoperate with third party websites, software applications, and data services, including rich Internet applications (“Third Party Offerings”). Your access to and use of any Third Party Offering, including any goods, services or information, is governed by the terms and conditions respecting such offerings. Third Party Offerings are not owned or provided by Adobe. 8.1 Use. Adobe AIR uses digital certificates to help you identify the publisher of Adobe AIR applications created by third parties. Adobe Reader uses digital certificates to sign and validate signatures within PDF documents and to validate certified PDF documents. Your Computer may connect to the Internet at the time of validation of a digital certificate. Digital certificates are issued by third party certificate authorities, including Adobe Certified Document Services (CDS) vendors listed at http://www.adobe.com/go/partners_cds (“Certificate Authorities”), or can be self-signed. 8.2 Terms and Conditions. Purchase, use and reliance upon digital certificates is the responsibility of you and a Certificate Authority. Before you rely upon any certified document, digital signature or Certificate Authority services, you should review the applicable terms and conditions under which the relevant Certificate Authority provides services, including, for example, any subscriber agreements, relying party agreements, certificate policies and practice statements. See the links on http://www.adobe.com/go/partners_cds for information about Adobe’s CDS vendors. (c) a certificate may be a self-signed certificate not provided by a Certificate Authority. YOU ARE SOLELY RESPONSIBLE FOR DECIDING WHETHER OR NOT TO RELY ON A CERTIFICATE. UNLESS A SEPARATE WRITTEN WARRANTY IS PROVIDED TO YOU BY A CERTIFICATE AUTHORITY, YOU USE DIGITAL CERTIFICATES AT YOUR SOLE RISK. 8.4 Third Party Beneficiaries. You agree that any Certificate Authority you rely upon is a third party beneficiary of this agreement and shall have the right to enforce this agreement in its own name as if it were Adobe. (e) failure to perform any of the obligations as required in the terms and conditions related to the services. The Software is being delivered to you “AS IS” and with ALL FAULTS. ADOBE AND ITS SUPPLIERS AND CERTIFICATE AUTHORITIES DO NOT AND CANNOT WARRANT THE PERFORMANCE OR RESULTS YOU MAY OBTAIN BY USING THE SOFTWARE, CERTIFICATE AUTHORITY SERVICES OR OTHER THIRD PARTY OFFERINGS. EXCEPT TO THE EXTENT ANY WARRANTY, CONDITION, REPRESENTATION OR TERM CANNOT OR MAY NOT BE EXCLUDED OR LIMITED BY LAW APPLICABLE TO YOU IN YOUR JURISDICTION, ADOBE AND ITS SUPPLIERS AND CERTIFICATE AUTHORITIES MAKE NO WARRANTIES CONDITIONS, REPRESENTATIONS, OR TERMS (EXPRESS OR IMPLIED WHETHER BY STATUTE, COMMON LAW, CUSTOM, USAGE OR OTHERWISE) AS TO ANY MATTER INCLUDING WITHOUT LIMITATION NONINFRINGEMENT OF THIRD PARTY RIGHTS, MERCHANTABILITY, INTEGRATION, SATISFACTORY QUALITY, OR FITNESS FOR ANY PARTICULAR PURPOSE. The provisions of Section 9 and Section 10 shall survive the termination of this agreement, howsoever caused, but this shall not imply or create any continued right to use the Software after termination of this agreement. IN NO EVENT WILL ADOBE, ITS SUPPLIERS, OR CERTIFICATE AUTHORITIES BE LIABLE TO YOU FOR ANY DAMAGES, CLAIMS OR COSTS WHATSOEVER INCLUDING ANY CONSEQUENTIAL, INDIRECT, INCIDENTAL DAMAGES, OR ANY LOST PROFITS OR LOST SAVINGS, EVEN IF AN ADOBE REPRESENTATIVE HAS BEEN ADVISED OF THE POSSIBILITY OF SUCH LOSS, DAMAGES, OR CLAIMS. THE FOREGOING LIMITATIONS AND EXCLUSIONS APPLY TO THE EXTENT PERMITTED BY APPLICABLE LAW IN YOUR JURISDICTION. ADOBE’S AGGREGATE LIABILITY AND THAT OF ITS SUPPLIERS AND CERTIFICATE AUTHORITIES UNDER OR IN CONNECTION WITH THIS AGREEMENT SHALL BE LIMITED TO THE AMOUNT PAID FOR THE SOFTWARE, IF ANY. Nothing contained in this agreement limits Adobe’s liability to you in the event of death or personal injury resulting from Adobe’s negligence or for the tort of deceit (fraud). Adobe is acting on behalf of its suppliers and Certificate Authorities for the purpose of disclaiming, excluding and/or limiting obligations, warranties and liability as provided in this agreement, but in no other respects and for no other purpose. For further information, please see the jurisdiction specific information at the end of this agreement, if any, or contact Adobe’s Customer Support Department. You agree that the Software will not be shipped, transferred or exported into any country or used in any manner prohibited by the United States Export Administration Act or any other export laws, restrictions or regulations (collectively the “Export Laws”). In addition, if the Software is identified as export controlled items under the Export Laws, you represent and warrant that you are not a citizen, or otherwise located within, an embargoed nation (including without limitation Iran, Syria, Sudan, Cuba, and North Korea) and that you are not otherwise prohibited under the Export Laws from receiving the Software. All rights to use the Software are granted on condition that such rights are forfeited if you fail to comply with the terms of this agreement. (c) England, if a license to the Software is obtained when you are in any other jurisdiction not described above. The respective courts of Santa Clara County, California when California law applies, Tokyo District Court in Japan, when Japanese law applies, and the competent courts of England, when the law of England applies, shall each have non-exclusive jurisdiction over all disputes relating to this agreement. This agreement will not be governed by the conflict of law rules of any jurisdiction or the United Nations Convention on Contracts for the International Sale of Goods, the application of which is expressly excluded. If any part of this agreement is found void and unenforceable, it will not affect the validity of the balance of this agreement, which shall remain valid and enforceable according to its terms. This agreement shall not prejudice the statutory rights of any party dealing as a consumer. This agreement may only be modified by a writing signed by an authorized officer of Adobe. updates may be licensed to you by Adobe with additional or different terms. This is the entire agreement between Adobe and you relating to the Software and it supersedes any prior representations, discussions, undertakings, communications or advertising relating to the Software. 16.1 Limitation of Liability for Users Residing in Germany and Austria. (ii) Adobe shall not be liable for damages caused by a slightly negligent breach of a non-material contractual obligation. 16.1.2 The aforesaid limitation of liability shall not apply to any mandatory statutory liability, in particular, to liability under the German Product Liability Act, liability for assuming a specific guarantee or liability for culpably caused personal injuries. 16.1.3 You are required to take all reasonable measures to avoid and reduce damages, in particular to make back-up copies of the Software and your computer data subject to the provisions of this agreement. Adobe, AIR, Authorware, Flash, Reader, and Shockwave are either registered trademarks or trademarks of Adobe Systems Incorporated in the United States and/or other countries. Copyright 2006-2008 Adobe Systems Incorporated. All Rights Reserved. Patents pending in the U.S. and/or other countries. Our likely next Prime Minister, Michael Ignatieff, is an interesting character. Presently, the Conservatives run a TV ad suggesting that Ignatieff is not a proper Canadian, having spent a lot of time abroad, but they completely miss the point: as an academic intellectual, yes, Ignatieff spent a lot of time at Harvard, Cambridge, and Oxford, but I’d think that only strengthens, not weakens, his resume. His views are another issue. Some have grave reservations about Ignatieff because of his apparent support for the war in Iraq and for controversial detention policies. I admit I am one of these doubters. Which is why I decided to read several of Ignatieff’s articles on these topics. The impression I came away with, however, is overall a positive one. I may strongly disagree with Ignatieff on some issues, but judging from his writing, he’s not only an intellectual but an honest one. If only he could maintain that quality when he becomes our Prime Minister… Well, we’ll know when we’ll know, won’t we? Yes, it looks more than a little suspicious: a former Prime Minister of Canada, meeting an internationally known arms dealer in secret at airport hotels and such, accepting large wads of cash in envelops, ostensibly for his lobbying efforts. One thing Mulroney’s lawyers have not yet mentioned though is that in Europe, it is a lot more common to use cash, even for business transactions, than here in North America. So was Schreiber giving Mulroney cash because he thought it was normal? Perhaps… but then, why did Mulroney not just immediately deposit the cash into his bank account, like any normal person would? Mulroney protests his innocence, even came close to tears at one point. I’d like to believe him… after all, I voted for him! But for now, I remain unconvinced. Given the less than perfect record of the Ariane 5 launch vehicle, there was reason for concern given that two new great observatories, Herschell and Planck, were launched on the same rocket this morning. Fortunately, the launch was successful, and both spacecraft are now on their merry way. Herschell is an infrared/submillimeter wavelength telescope, while Planck is “WMAP on steroids”, expected to provide much higher resolution views of the cosmic microwave background than its predecessor. The space shuttle Atlantis is on its way to the Hubble Space Telescope. If the planned repairs are successful, Hubble may get another five years or more before it has to be decommissioned. Originally, the plan was to return it to the Earth, but in the wake of Columbia, that has been deemed to risky… now, it will be deorbited, to ensure that its large mirror (which is not expected to burn up in the atmosphere) doesn’t fall on an inhabited area. But hopefully, that is still many years away. I saw the package that is now in the belly of Atlantis when I was at Goddard last summer. Well, maybe not quite the same package as, after the repair mission was postponed, I believe they added a few bits to it, but still, it’s largely the same. Sadly, this mission may also be the very last really useful mission of the shuttle fleet. That is not to say that they won’t fly several more missions… but they are all to the International Space Station, and while I am an enthusiastic supporter of manned space exploration, flying meaningless circles in low Earth orbit just isn’t it… it’s a waste of money, and a pointless risk to the astronauts’ lives. Perhaps this display should serve as a reminder that what really happened on May 9, 1945, was that the struggle between the world’s two worst totalitarian, militaristic tyrannies ended with the victory of one and the complete defeat of the other. Revolting as the Nazi regime was, Soviet style communism was just as oppressive and murderous. Sure, for members of “inferior races”, as the Nazis called them, a Soviet victory was preferable because at the very least, Stalin did not institute a systematic program to eradicate entire ethnicities and turn their ashes into soap. (Arguably, he didn’t have to; whereas Hitler’s plans to deport Jews to Madagaskar had no basis in reality, Stalin had room in his vast empire to set up a “Jewish Autonomous District” some five thousand miles east of Moscow, where he planned to deport most of the Soviet Union’s Jewish population. The district curiously still exists in today’s Russia, although only about 1% of its population is actually Jewish.) But in terms of overall results, Stalin was just as “productive” as the Führer, murdering countless millions and ruining the lives of many more, governing an empire that was founded on fear and oppression. 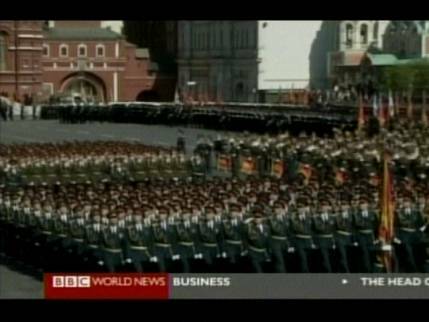 An empire that, curiously, many Russians would like to see return, as this fine military display reminds us. The EU banned the import of Canadian seal products, in an attempt to stop the cruel practice of seal hunting. About bleeping time, I say. We can thank Brussels for making a decision that our own spineless politicians were unwilling to make. Yes, it means the loss of income for some who made a (part-time) living from hunting seals. I am not against them but what can I say? Should we also reinstate the death penalty just so that we don’t end up with unemployed executioners? There is also a concern that stopping the seal hunt would threaten already depleted fish stocks, as seals that would otherwise be hunted will eat millions of tons of fish. Inflated numbers aside, there may be some truth in that… but again, chances are humans eat a lot more fish than seals do, so if we’re really concerned about the future of fish stocks, perhaps it’s time to fish a little less and not treat the oceans as an undepletable source. Now if only our politicians were smart enough to move on and not spend millions of taxpayer dollars (more than the entire industry is worth) to fight this eminently reasonable and humane European decision… Those millions would be much better spent on the battle to block American efforts to export a Draconian copyright law to our country, a fight in which the latest round was fired recently when the Obama government put Canada on the same blacklist of copyright violators that contains Russia and China. All because we’re unwilling to give Mickey Mouse a 99 year copyright and put kids on jail for sharing music online. Jack Kemp has died. He was a former American Congressman and vice presidential candidate, also a champion of the theory of supply side economics. The basic premise of supply side economics is that lowering taxes increases demand; increased demand means a healthier economy, hence more tax revenue. Others say hogwash, supply side economics is just a euphamism for making the rich richer at the expense of the public treasury, i.e., ultimately at the expense of the poor. So which side is right? Neither. Or, to be more precise, neither side is right all the time, though both have a point. Yet both are liars, since both elevate to the level of universal truth a principle that is right only some of the time. In reality, the curve may be more complicated, but it’s going to be continuous and it’s going to be positive between the end points, hence it will have (at least one) maximum. And here’s the kink. The supply siders are right if the current rate of taxation happens to be to the right of that maximum… lowering the tax rate would indeed increase economic activity and hence, government revenue. But if the present taxation rate is to the left of the maximum, decreasing the tax rate will decrease revenue, and while it may increase economic activity, it certainly also increases the public debt. So the trick, for a responsible but cash-strapped government, would be to find the maximum of this curve not to subscribe to any political ideology. Not that it’s likely to happen… politicians need snappy soundbytes to secure victory, not boring explanations. Rogers is an interesting company. Sometimes, they are super competent. I remember when cable modems were new… I got one fairly early (and still use a cable connection as my backup Internet connection) and whenever I had a technical problem (which was rare) I was immediately able to get competent help on the telephone. Or when a contractor managed to cut our underground cable… Rogers was here almost faster than it would take for the police to arrive. Within half an hour they had a temporary solution rigged, and by the next day, everything was back to normal. They even apologized that they had to unplug us for another few seconds once the underground cable was repaired and reconnected. Yet at other times, they are just blatantly incompetent. Such as when it took them months to sort out billing issues that only amounted to a few cents in the end. Or take this past week. I phoned Rogers because I noticed that on CNN, instead of getting stereo audio all I get is the right channel. Perhaps not so much a problem for a news channel, but I am seeing similar problems with other channels, including MuchMusic, where it can be a bit more problematic, for all the obvious reasons. I reported this over a week ago, but no solution yet, not a peep from Rogers. And then there is this other thing… being a weekend, Rogers is showing a preview of a premium channel, which this weeks happens to be the CBC’s Documentary Channel. So far so good, and I in fact caught a rather interesting program on it, about the history of the East German Trabant automobile and its current fans. Much of the dialog was in German, and it was subtitled. Except that every so often, the subtitles were covered for an extended period of time by a Rogers banner about the preview. Now yes, of course they want us to know that it is a preview and that this channel can be ordered along with many others… but must they demonstrate at the same time just how little they actually care about their viewers? Not that Rogers is alone in this regard… many channels have picked up the nasty habit of overlaying a rather large, often quite disconcerting banner advertising the next show, for instance. And not infrequently, they do so while subtitles or other important pieces of information would appear there.